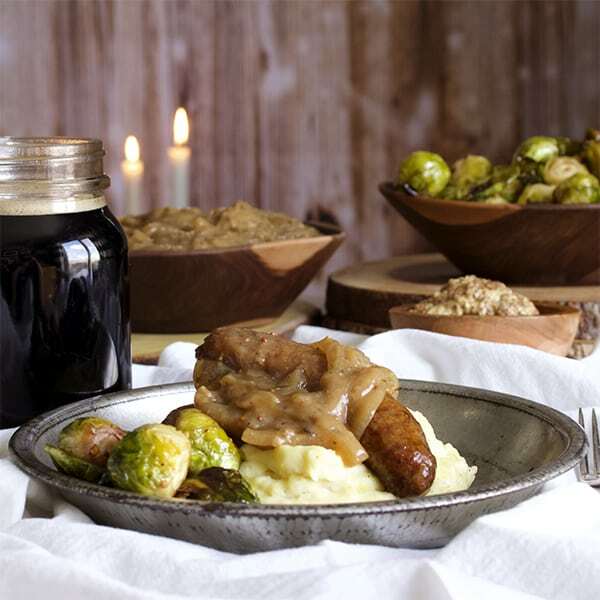 Buttery cream cheese mashed potatoes topped with Guinness cooked bratwurst sausages and rich onion gravy flavored with thyme, mustard, and more Guinness. Comfort food doesn’t get any more comforting than this. Why are Bangers and Mash Called Bangers and Mash? I also learned during my 5 minutes of research that Bangers and Mash are frequently rated as Britain’s favorite comfort food, something that makes complete sense to me. 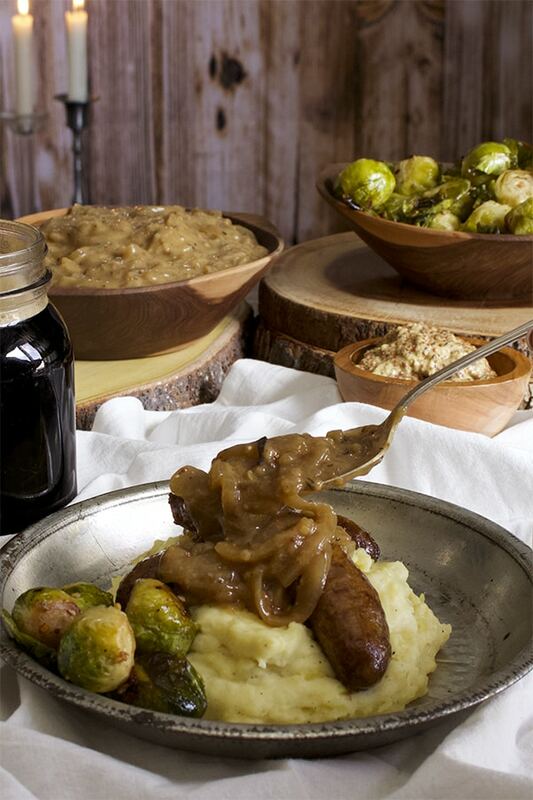 I mean, is it even possible to get more comforting than creamy mashed potatoes topped with sausages and gravy? Considering the WWI origins of the word “bangers”, I realize the irony of using German bratwurst to make this dish. But, I did it anyway. Hello. I am an American who’s fond of making British bangers and mash with German bratwurst. Here’s the thing – if we wanted to get all traditional, Cumberland sausage is the way to go. Cumberland sausage is delicious. Truly. I’ve had it a couple of times and it’s meaty and flavorful and everything you’d want in your bangers and mash. I’ve also never seen it sold in my local market. But, you know what kind of sausage is also delicious and always available at my local market? Bratwurst. And that, my friends, is why Bratwurst is used in this recipe. I love the flavor and it’s available where I shop. I can’t think of better reasons. You should use whatever sausage you like. Does your local market stock Cumberland sausage? Use that. Otherwise, use whatever kind of sausage you prefer, bratwurst or otherwise. The onion gravy is delicious, but also optional. Bangers and mash is sometimes served with gravy and sometimes not. It’s good either way. If you want to skip it, just make the mashed potatoes and then skip to step #4 in this recipe. 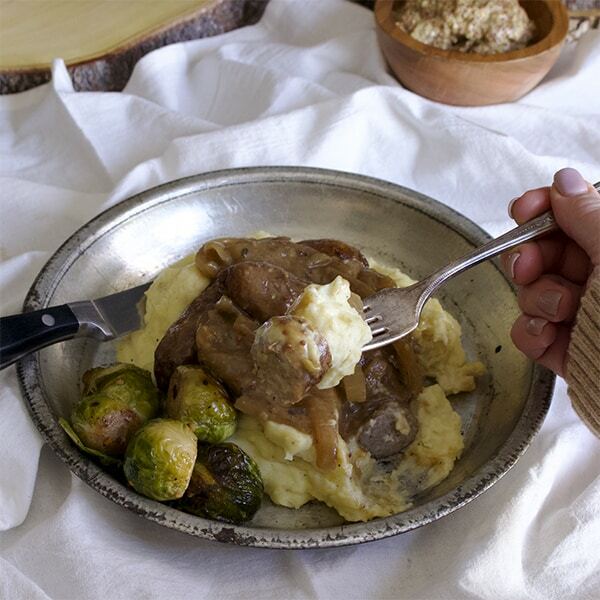 If you do skip the gravy, I’d suggest serving this dish with a generous amount of grainy mustard. 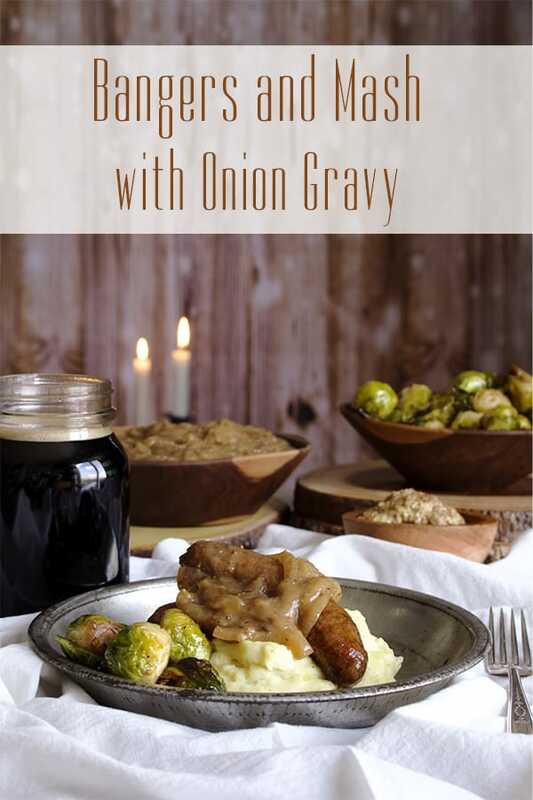 The gravy contains a lovely assortment of pungent, vinegary flavors that are gorgeous with the creaminess of the mashed potatoes and salty sausage. Mustard isn’t the same as onion gravy, of course. But it will add in some of the same flavors. 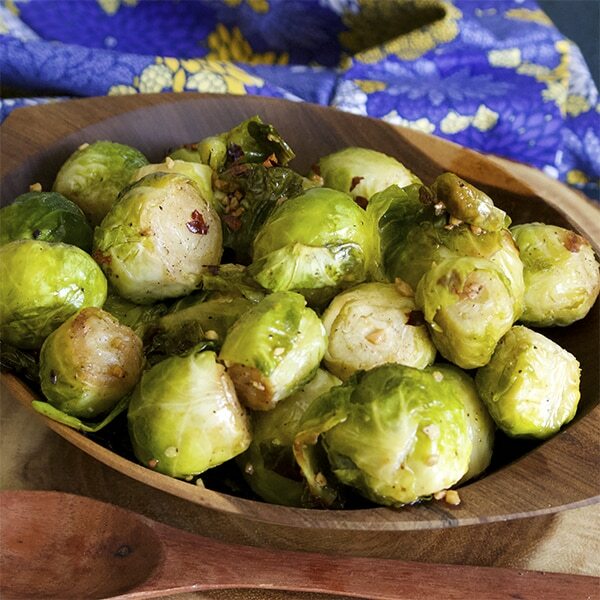 I generally think a rich dish like this one begs to be served with a green vegetable, and Roasted Brussels Sprouts is perfect here. They only take about 10 minutes of hands on prep work and can roast in the oven while you carry on making bangers and mash on the stovetop. 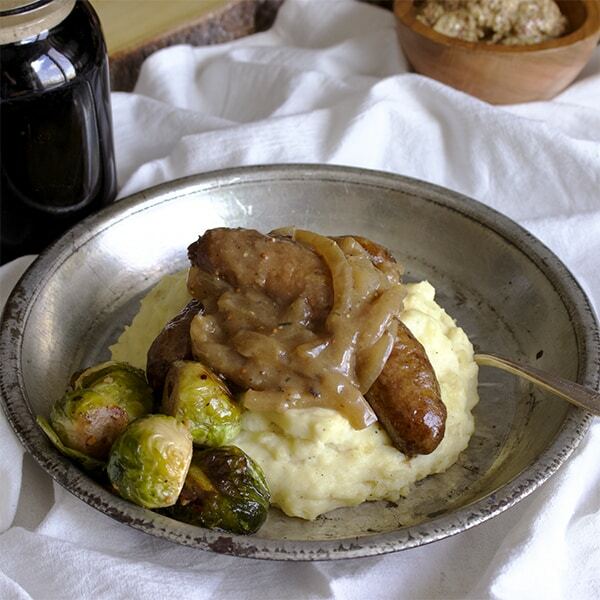 Buttery cream cheese mashed potatoes topped with Guinness cooked bratwurst sausages and rich onion gravy flavored with thyme, mustard, and more Guinness. Prepare Cream Cheese Mashed Potatoes. Cover and keep warm while making the sausages and onion gravy. Heat butter in a large saucepan set over medium heat until melted. Add the onions, Worcestershire sauce, thyme, salt and pepper. Cook, stirring frequently, until the onions are a rich golden brown, about 10-15 minutes. Sprinkle the flour over the browned onions and cook, stirring constantly, for 1 minute. Slowly pour in 7 ounces of Guinness, stirring constantly as you pour. Pour in the chicken stock, then add the mustard and bay leaf. Turn the heat up to medium-high and the gravy to a boil, then turn the heat down to medium-low and let simmer for about 30 minutes, stirring frequently. While the gravy simmers, add the vegetable oil to a large skillet and heat medium-high heat until the oil is shimmering. Add the sausages to the hot oil and let cook on one side until browned, about 4 minutes. Turn the sausages over and let brown on the other side. Pour the remaining 14 ounces of Guinness into the pan with the sausages and turn the heat down to medium. Let cook until the sausages are completely cooked through and most of the Guinness has evaporated, 10-15 minutes. Taste the gravy and add more salt, pepper, or mustard if desired. To serve: Top a generous amount of cream cheesed mashed potatoes with one or two sausage and a couple spoonfuls of onion gravy. Sprinkle with a bit of fresh parsley.